Cleanroom tacky mat is a perfect solution for critical environment because it efficiently capture and remove dirt or contamination on wheels and shoes at entrances of controlled areas. Tacky mats are widely applied in electronics, hard-disk drive, pharmaceutical, medical and food processing industries etc. It has different level of tackiness which suits for different applications and requirements. 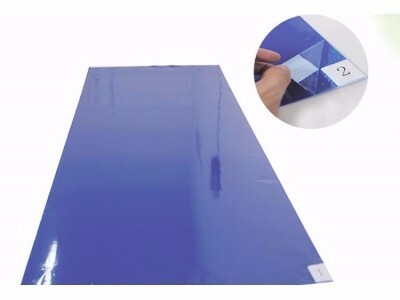 Antistatic Cleanroom Tacky Mat is not only able to be used in the cleanroom environment, but also able to offer the ESD production to meet the stringent demand. ESD Sticky Mat is the fast, convenient and most reliable way to keep floors and environment contaminants free. The technology and the know-how have been mature and stable over years of usage and application worldwide. The specifications above can be adjusted per customers’ requirements.